In Theatricum Botanicum’s All’s Well That Ends Well, the action begins and ends with a song. At rise it is the somber lamentation that accompanies a funeral procession and at the play’s conclusion, an uplifting madrigal “Sing We Enchant It.” This bookending of the play with two very different types of music – sacred vs. secular – is one of the ways that co-directors Ellen Geer and Christopher W. Jones subtly underscore the distinctions presented in Shakespeare’s lesser-known comedy. Another is the way they cast the high-born and low-born characters. 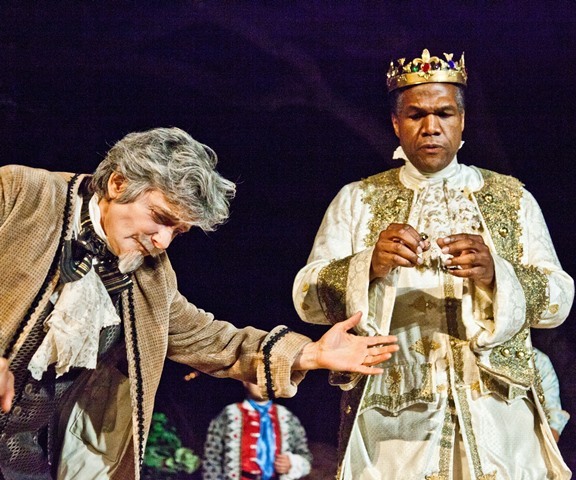 Though race is not specified in the text, the decision to use actors of color for the former and Caucasian actors for the latter works on the modern sensibilities of the audience. It broadens our perceptions while making a very important point: good breeding is not always synonymous with good character. If it were, Bertram (Max Lawrence), with all the wealth and privilege afforded by his station, would not behave like such a cad. The action moves back and from France to Italy as Helena (Willow Geer), a well-respected young woman of virtue, but without comparable social status, concocts a plan to marry him. To do so she cures the King of France (Wayne Stribling, Jr.), to whom Bertram is in service, using remedies she learned from her father. As her reward, the king agrees that she may marry the man of her choice and when Bertram resists at her naming, the king forces the marriage. While he is now legally hers, he vows never to become husband to her in any way other than name until she can procure the ring from his finger and show him a child begotten of his body. With that he is off to the wars and Helena takes up the gauntlet to win him again, which she does, ensuring that all will end well as the title forecasts. Playing one of Shakespeare’s loveliest characters, an appealing Geer beautifully handles the curves Helena is thrown that would keep her from achieving her goal. Not one to give in to frustration or anger, she instead meets each challenge with grace, revealing an uncanny ability to convince others to do what she asks. In Geer’s hands we see Helena’s inherent goodness which allows us to happily rally to her cause. The same cannot be said for poor Bertram however. There’s not much that’s likable about this petulant young man and Lawrence’s choice to stay constantly annoyed keeps the audience from finding any part of his argument reasonable. He runs away when things don’t go his way, courts another woman even after he is married, and does little more than unhappily acquiesce when he is bested in the end. Part of that is most certainly the influence of the saucy Captain Parolles, played with delicious irreverence by Mark Lewis. He is often the object of criticism by Lafeu (Melora Marshall) who delights in one-upping him every chance he gets. Marshall creates another thoroughly engrossing character portrait, this time of a wise old gentleman whose insight is of great value to the play and the source of many a laugh in the process. A better-than-ever Earnestine Phillips rules all as the Countess of Rousillon. Direct and outspoken in her opinions, she is in favor of the match between Helena and her son, and Phillips’ animated observations are candid and humorously proffered. She has a playful, if somewhat crotchety, relationship with her clown Lavatch (Alan Blumenfeld at this performance), whose bargain basement humor remains considerably bawdy throughout the play. A lively group of soldiers, lords, ladies and commoners fills out the 18th Century picture, all lavishly costumed by Ben Kahookele with appropriately rich set dressing by props master Ashton Williams. The production’s authenticity extends to both its trappings and its conventions as it challenges the validity of both in the pursuit love. 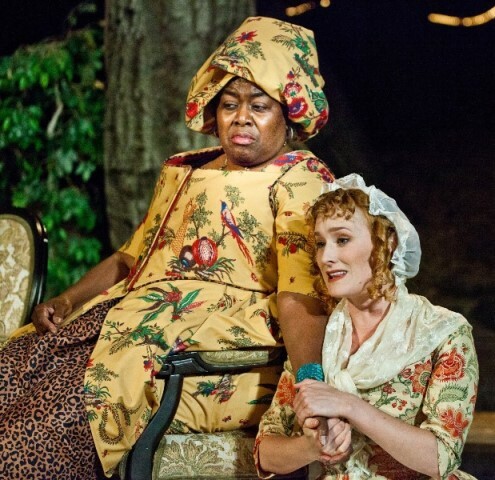 On Theatricum Botanicum’s outdoor stage, it is as congenial an exploration of human behavior as you are like to find anywhere and a tale for a summer night that is a pleasure to behold. Melora Marshall and Wayne Stribling, Jr. The outdoor amphitheater at Will Geer’s Theatricum Botanicum is terraced into the hillside of the rustic canyon. Audience members are advised to dress casually (warmly for evenings) and bring cushions for bench seating. Snacks are available at the Hamlet Hut, and picnickers are welcome before and after the performance.